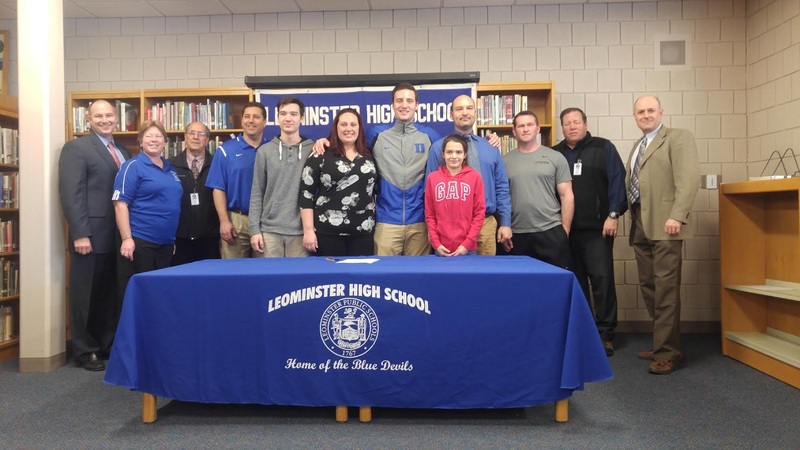 Leominster's Noah Gray surrounded by family, coaches and educators. At a ceremony in the Leominster High School library, Noah Gray celebrated making his long-standing commitment to Duke University official. 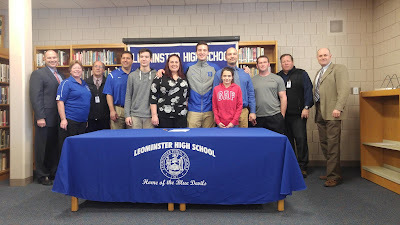 The Gray family sent in Noah's National Letter of Intent earlier Wednesday morning, but the emotions were still flowing when Noah addressed the Leominster community around noon. "My parents have been an inspiration to me, I look up to them every single day," Gray said, while choking up a bit. "I'm grateful for them, and my brother and my sister, they've been a blessing to me. I've just been blessed with amazing people around me." Committed to Duke since early last summer, Gray went on to thank his classmates, teammates and coaches, whom he says have all prepared him to play at the major Division I level. Duke recruited Noah as a tight end, and that remains the plan, perhaps even more so after the star senior moved from quarterback to wide receiver/tight end midway through last season, and put on a show catching the ball down the stretch. Obviously, Duke's sterling academic reputation was a large part of Noah's decision, but being recruited by a renowned offensive mind like head coach David Cutcliffe didn't hurt either. "Well, first off, I can't really say no to coach Cut," Gray said with a smile. "Him and the rest of the coaching staff were really appealing to me, and I've built some great relationships down there the past couple months. Everything about (Duke) was great. The education was a big thing. I wanted something that would make me excel after college." Another thing working in Duke's favor was the fact that Noah's grandfather, on his father's side, lives in North Carolina, and will be able to drive over to watch him play. Noah said his grandfather flew into Massachusetts and drove to Leominster to watch all his high school games, so playing in NC is the least he could do to give his grandpa a break. Sounds like a solid plan to me. Gray also added that, while other schools did come calling, he never considered switching from Duke. Stay tuned to SuiteSports throughout the day for more National Signing Day coverage.